The peace march and vigil was organized by an ecumenical committee of faith leaders from the World Council of Churches, National Council of Churches of Korea, United Methodist Church, United Methodist Women, United Church of Christ, among several others. The committee had organized a two-day gathering in Washington, DC on July 25 and 26, 2014 that, in addition to the march and rally, included an ecumenical roundtable, advocacy visits with the White House and Ambassador Robert King, Special Envoy on North Korea Human Rights, and an evening film screening of Memory of Forgotten War by Ramsay Liem and Deann Borshay Liem. The occasion was the 61st anniversary of the Armistice Agreement that halted the Korean War. The United States, China and North Korea signed the Armistice on July 27, 1953 committing to replace it with a permanent peace treaty. Six decades later, we’re still waiting. A victory? How could a war that claimed four million, mostly civilian lives, be considered a victory? How could it be a victory to the 10 million families who are still separated by the world’s most militarized border with 1.2 million landmines? How is it a victory for the millions of North Koreans living under the harshest sanctions ever, struggling to access food, medicines and the basics to lead a life of dignity? How it is a victory for democracy where the militarization and repression on both sides of the De-Militarized Zone (DMZ) has imprisoned the Korean people to live in a constant state of fear and war? We gathered in front of the White House to let President Obama know that the Korean War was far from victorious, and that the United States, as a key signatory to the Armistice Agreement, has a responsibility to end the Korean War. We were also there to let the Obama administration know that its North Korea policy, known as “strategic patience,” has been an utter failure. A combination of military aggression and intensified economic sanctions to force Pyongyang to de-nuclearize, Obama’s policy was created on the assumption that once Kim Jong-il passed away, internal strife in North Korea would lead to regime collapse. Unfortunately, South Korean President Park Geun-hye hasn’t made any substantive changes in Seoul’s position vis-à-vis Pyongyang. While Park’s rhetoric idealizes the potential of reunification, particularly in terms of economic growth and access to North Korea’s vast mineral resources, Seoul’s policy, like Washington’s, still hinges on denuclearization and improving human rights before engagement. Whether conservative or liberal, the issue of divided families strikes a chord in the hearts of all Koreans, their families and communities. Every Korean family has a story. I shared the story of my sister who told me that when she met her in-laws, after a long evening of getting to know each other, the father disclosed to her that he actually had a family in the North, a wife and two sons, which he had left behind before the Korean War broke out. Once the border was drawn, he was not able to ever see them again. After trying for many years to get in touch with them, he gave up and re-married. He told my sister, “I still really miss them. Those are my children I left behind.” He recently died with the picture of his North Korean family in his pocket. After a decade of family reunifications under the Sunshine Policy of former South Korean Presidents Kim Dae Jung and Roh Moo Hyun, family meetings were virtually stopped by his successor, President Lee Myung Bak. Under Park, reunions have been on again, off again, but with political support from Washington, they could be revived on a regular basis. Congressional resolutions in 2001 endorsed family reunifications stating: “Resolved by the House of Representatives (the Senate concurring), that it is the sense of Congress that… Congress and the President should support efforts to reunite people of the United States of Korean ancestry with their families in North Korea….” We should thus urge the revival of U.S. support of family reunifications. The U.S. has come dangerously close to being unintentionally drawn into a full-scale war due to skirmishes in Korea. Last spring, the conflict spiraled dangerously out of control when, in response to North Korea’s nuclear test, Washington dispatched, in an unprecedented show of force, nuclear-capable B-52 and stealth B-2 bombers and F-22 warplanes across Korean seas and skies during war games with Seoul. In response, Pyongyang shifted its rhetoric from Seoul to Washington, threatening “merciless strikes” on the U.S. and its allies. Most Americans don’t realize this, but the Combined Forces Command (CFC) is led by a four-star American general with wartime Operational Control (OPCON) over South Korea. U.S.-R.O.K. military exercises, which simulate nuclear attack and regime change of North Korea, not only heighten tensions with Pyongyang but also Beijing, which is using this show of force and the U.S. pivot to Asia to justify double digit annual increases in military expenditures. With nearly 70 million Koreans on the peninsula, the outbreak of war would be devastating. In 1994—twenty years ago before North Korea acquired nuclear weapons—the U.S. Defense Department calculated that another war in Korea would result in 1.5 million casualties within 24 hours of the outbreak of hostilities. Not only would the U.S. be drawn into war by treaty, the conflict would likely draw in other regional powers such as China, Japan and Russia. Americans don’t want to be involved in another military conflict that could be resolved diplomatically. What most Americans don’t understand is how U.S. sanctions policy—intended to put pressure on the Kim regime—has served as a chokehold on the North Korean economy and ordinary people. The ability of the people to access the basics—from food to seeds to medicine to technology—is greatly strained by U.S.-led international sanctions against the DPRK. The unended Korean War provides justification for increasing defense spending and further militarization of the region. At a March 25 Senate Defense Committee hearing on the 2015 budget, the commander of the U.S. Forces in Korea (USFK), General Curtis Scaparrotti, argued that while the 28,500 U.S. troops based in South Korea were “fully resourced,” he was concerned about the readiness of “follow-on” forces needed if fighting erupted, suggesting the need for more resources to Korea. In response to heightened tensions with Pyongyang, according to journalist Tim Shorrock, a new THAAD portable defense system was deployed to Guam and plans are underway for a massive expansion in U.S. missile defense systems in Alaska and along the west coast as a “precautionary” measure against possible North Korean missile strikes. Lee argues, “U.S. conventional forces no longer hold the same tactical value as they did during the Cold War, and America’s fragile economy cannot continue to withstand the financial drain.” He estimates that a withdrawal of U.S. forces from South Korea could result in savings of $100 million per month, excluding the costs of the annual joint exercises. There is wide consensus that replacing the temporary armistice agreement with a permanent peace treaty would go a long way towards de-escalating tensions that have long plagued Korea and the region. Gregg believes Kim Jong-Un is someone Washington can negotiate with, not only because he was raised and educated in Europe, but also because by prioritizing economic development and dismissing hard-line generals, he clearly understands the importance of uplifting the living standards of the population and has demonstrated a commitment to that goal. These past few years have felt dark and bleak, especially in light of the significant progress Korea had made towards peace and reconciliation. And in these times, we have felt our path may forever be lost. But as in past movements for peace and justice, the ecumenical community has played an important role, driven by its convictions and faith, to push forward and play a courageous role and offer light. After all, it was Korean pastors who urged Jimmy Carter to go to Pyongyang armed with a CNN camera crew to cover the diplomatic breakthrough with Kim Il-Sung that averted war in 1994 and led to the Agreed Framework in which Pyongyang agreed to freeze its plutonium reactors in exchange for energy assistance, and eventual normalization of relations with the U.S.
Our political leaders will not move unless we, the people, move them. A peace treaty would go a long way towards defusing dangerous tensions in Northeast Asia. For the elders dying with their hearts broken, for our families still traumatized by an unended Korean War, and for a brighter future built on peace and hope for a world free from more militarization and war, let there be a peace treaty. The ecumenical forum, peace march and vigil was the beginning of a powerful grassroots force that, I believe, will join together and work to achieve a peace treaty within the final years of the Obama administration. Christine Ahn is Director of “Women De-Militarize the Zone”, an FPIF columnist, and a Korea Policy Institute Advisory Board member. To raise greater awareness and understanding about the need for peace on the Korean peninsula, the Alliance of Scholars Concerned about Korea (ASCK) and the National Campaign to End the Korean War (NCEKW) call for individuals and organizations to organize public events during Fall 2013, Spring 2014, and Summer 2014 to commemorate Korea Peace Day. Korea Peace Days were held in November 2013 at University of California at Santa Cruz, University of California at Berkeley and City College of New York. During this sixtieth anniversary year of the July 27, 1953 Korean War armistice, recurring tensions on the Korean peninsula serve as a sobering reminder that renewed war is a persistent danger. The Alliance of Scholars Concerned about Korea (ASCK), an organization of primarily U.S.-based scholars concerned with U.S. policies towards the Korean peninsula, and the National Campaign to End the Korean War (NCEKW), a coalition of U.S. human rights, community, veterans, and faith-based organizations, therefore seek to renew a peacemaking tradition that began a decade ago as Korea Peace Day. 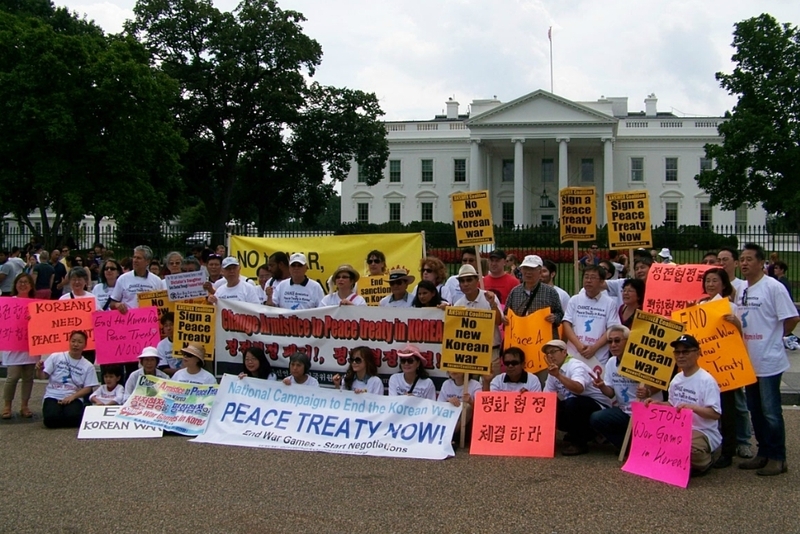 With inaugural events scheduled for November 7-8 at UC Santa Cruz and Berkeley, Korea Peace Days 2013-2014 will continue at different locations throughout North America for several months until July 27, 2014. We invite all concerned people and organizations to express support for a peaceful resolution of the ongoing tensions between the United States and North Korea by organizing local Korea Peace Days on college and university campuses as well as neighborhoods and communities throughout the United States. Already this year, the National Campaign has organized teach-ins as well as public actions, and it will add Korea Peace Days to its campaign to formally end the Korean War. For the remainder of this year and until July 27, 2014, Korea Peace Days held across the nation will signal a growing consensus for peaceful U.S.-Korea relations. The Korean War constitutes the longest military conflict in U.S. history. That war killed more than three million Koreans, more than half a million Chinese, and more than 35,000 Americans. Sixty years ago, on July 27, 1953, an armistice was signed to end the fighting in the Korean War. It recommended that a permanent peace agreement and the withdrawal of all foreign troops be achieved posthaste. Yet, a formal end to the war has never been negotiated. To this day, Korea remains divided, and the United States and North Korea remain technically at war. The first Korea Peace Day was held ten years ago on November 6, 2003, with events taking place at over forty colleges and universities throughout the United States. As on that day, Korea Peace Days 2013-2014 are dedicated to ending the war by advocating for a peace agreement to replace the armistice and calling for a rejection of the use of military force on the Korean peninsula. These events will illuminate the history of the current tensions and the importance of U.S. dialogue, cooperation, and active pursuit of peace with both Koreas, North and South. They will highlight the stalemated Korean War as a principal obstacle to resolving both the current hostilities and the painful unresolved human legacies of the war. The broader the participation of campuses and communities in Korea Peace Days, the more effective our call for peace will be. Be part of a national movement to bring an end to the Korean War and to urge dialogue and diplomacy as the only acceptable means for resolving dangerous tensions in U.S.-Korea relations. See suggested activities below, or go straight to Resources for Korea Peace activities. If you want to help your community become a part of Korea Peace Days 2013-2014, here are suggestions and supporting resources for events that would be easy to organize. Please confirm your willingness to organize a Korea Peace Day and send any questions or suggestions to koreapeaceday2013@gmail.com. Invite a speaker or panelists to present or discuss a variety of issues related to the objectives of Korea Peace Days. This portion of the program can be tailored to local interests and expertise and can be held in conjunction with a film screening. Include local performers as available (e.g., a Korean drumming troupe). Endorse Representative Mike Honda’s statement to Congress supporting a peace agreement to end the Korean War and calling for dialogue with all relevant parties. Take part in the photobooth option and an Obama postcard campaign that have thus far accompanied screenings of Memory of Forgotten War. Set up a table on campus or community centers for people to write letters to their elected officials urging a peace agreement to formally end the Korean War. Organize a house or block party and mobilize your neighbors and friends for peace. Local organizers may have other ideas and can also engage audiences in a discussion of strategies for action. These are suggestions, but the format of Korea Peace Days is up to you. Some Korea Peace Days might focus on speakers or a panel and others on cultural programming. The list of Korea Peace Days Resources (see separate document) should be useful regardless of how your program is designed. If possible, please include an Action component to provide participants with options to lend their support to Korea Peace Days objectives. Getting the word out about your Korea Peace Day will build momentum and encourage others to join in. Please tell us about your event details, send us links to local press coverage, and share event photographs. We’ll post them on the ASCK and NCEKW websites and send periodic alerts to others to show them what can be done. Email koreapeaceday2013@gmail.com. For Information and resources on Korea. 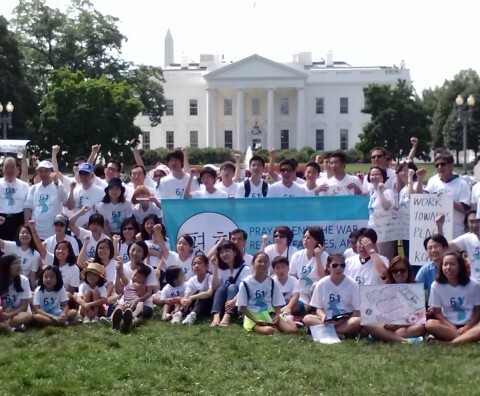 The National Campaign to End the Korean War, along with other groups will gather in Washington DC this July 26- 27th to call for Peace in Korea. July 27th, 2013 is the 60th Anniversary of the signing of the Korean War Armistice. The Armistice halted the military conflict temporarily – and was to be replaced with a Peace Treaty – which has yet to happen. It is time for a Peace Treaty to truly end the Korean War. 3 pm – 5 pm: Peace Strategy Meeting – Groups and concerned individuals who want to work on calling for a peace treaty. 10 a.m.: Peace March – starting at the Peace Monument at Peace Circle, First Street NW and Pennsylvania Avenue and ending at Lafayette Park. From award-winning filmmaker Deann Borshay Liem (First Person Plural; In the Matter of Cha Jung Hee) and Ramsay Liem, professor emeritus at Boston College, comes a powerful new documentary about the continuing impact of the Korean War. Memory of Forgotten War follows the stories of four Korean Americans who witnessed firsthand the war’s devastation and its aftermath. Drawing on the oral history collection of Still Present Pasts: Korean Americans and the Forgotten War, a multimedia exhibit directed by Professor Liem, this documentary is the first to tell about the experiences of Korean civilians who later immigrated to the United States. The memories recounted here challenge the historical amnesia that has long characterized America’s popular understanding of the so-deemed unknown war, and serves as a cogent reminder that for survivors and their families, it has remained anything but forgotten. and a solidarity photo booth. 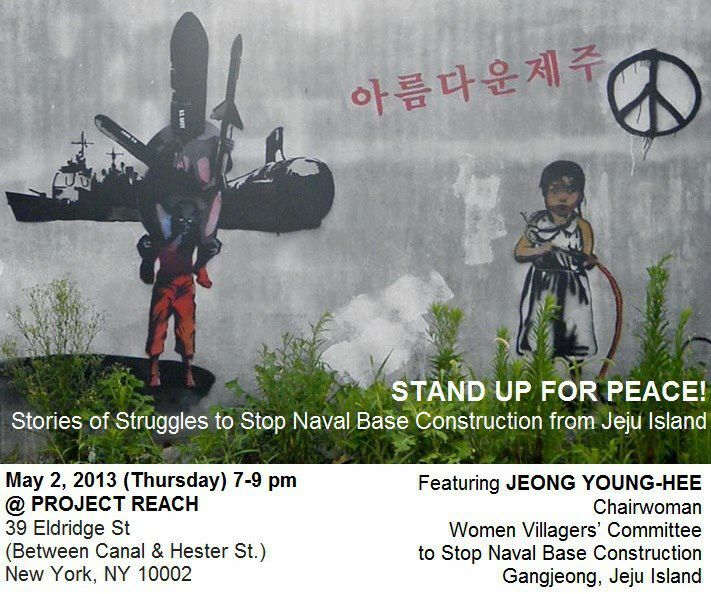 Join us as Ms. Jeong Young-Hee, chairwoman of the Gangjeong Women Villager’s Committee to Stop Naval Base Construction talks about the current state of the struggle to save Jeju island from destruction. This struggle has been going on for over 7 years now, as villagers have put their bodies on the line to stop the devastation of this beautiful island, which has unique coral reefs, lava coastline, a vast array of aquatic species – and families whose livelihoods are at stake. Beyond this – such a large naval base will only add to the military tensions in the region, already at a high level. On a national tour right now, Ms. Jeong is speaking in several cities in the US, and will finish at the UCLA ENDING THE KOREAN WAR conference and events, from May 8th-11th in LA. Project Reach39 Eldridge Street between Canal and Hester (closest stop: D train to Grand) FREE and Open to the public! “Bomb North Korea before it’s too late” was the title of a recent New York Times op-ed. As the drumbeat of war crescendos on the Korean peninsula, we bring together leading experts and activists to discuss what’s really happening – from the failure of the past twenty years of denuclearization talks, to the deleterious impact of decades of sanctions on the people of North Korea. Nodutdol, a New York City-based grassroots organization that works for peace and demilitarization of the Korean peninsula, teamed up with Asia Pacific Forum on WBAI FM to produce this timely roundtable. What’s really happening with North Korea? The war danger is real – but where is the danger really coming from? Find out what is at the root of the current crisis – and why, 60 years after the Korean War Armistice was signed – it’s time for a real peace treaty to truly end the Korean War. What’s Annoying the North Koreans? cosponsored by the UCLA Center for Korean Studies, the Korea Policy Institute, the United Methodist Women, the Alliance of Scholars Concerned about Korea, the National Campaign to End the Korean War. Moim gathering cosponsored by Nodutdol for Korean Community Development and others. The JoongAng Ilbo recently published an editorial titled ‘Why don’t we realize we’re at war?’, written by senior columnist Moon Chang-keuk. The headline is followed by the hook: “If we, as victims, vacillate, who will come to our aid? The response of the world depends on our next move.” Despite the fact that South Korea is currently in a state of national mourning for those who lost their lives in the sinking of the Cheonan naval corvette, Moon has no problem using the rhetoric of victimization to frame the conflict as a blatant act of aggression from North Korea. The JoongAng Ilbo is one of the “big three” newspapers circulated in South Korea – and also one of the most politically conservative as well. The use of napalm entered the scene during WWI. It was a weak form hosed from flamethrowers. It did not burn hot enough, long enough, and did not deplete the surrounding area of oxygen. The ingredients to make napalm are composed of naphthenic and palmitic acids. When mixed together, they form a soap-powder-like substance. When mixed with ordinary gasoline that is used in automobiles, a jelly-like substance is created. The film, A Little Pond, is made based on the true story of the “No-Gun-Ri massacre” during the Korean War.